A colorful aquarium usually requires a mix of saltwater fish, although freshwater enthusiasts do have an option if they fill their tanks with colorful, hardy African cichlids. These unique fish are as diverse as they are colorful, and they can be the foundation of a beautiful aquarium. Cichlids are freshwater fish that can be found in Africa, South America and some parts of Asia. Although the exact number of cichlid species isn't known, some estimates suggest between 2,000 and 5,000 species, including more than 1,000 species from Africa alone. Cichlids are very colorful fish, with different species spanning the full spectrum of the rainbow. In addition to being a favorite among hobbyists, cichlids are both local and global food sources. One of the most prolific edible cichlids throughout the world is the tilapia, which has been imported and is farmed across the globe. 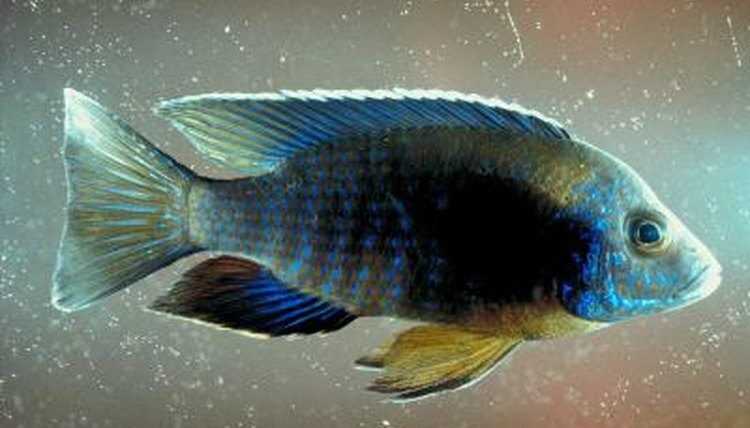 African cichlids live in the three rift Great Lakes in the southern part of the continent: Malawi, Tanginika and Victoria. African cichlids are secondary freshwater fish, which means their ancestors were saltwater fish that moved inland via the Congo, Limpopo, Zambezi, Malaragasi and other rivers. As the river waters became trapped in the Rift Valley, the saltwater river fish became freshwater lake fish. The cichlids evolved to live in every environment of the Great Lakes, including along rocky beaches, in deep sea beds and in warmer, shallow waters. African cichlids are the most colorful of any freshwater fish. These hardy, colorful fish are favorites in aquariums, as they adapt well to captivity. However, they can be very aggressive, even with their own species. In contrast to their behavior toward other fish, some cichlids can become quite interactive with their owners, swimming to the top of the water or the tank glass to greet their owners or eat from their hands. Because of their aggressive nature, aquariums need to be big enough to comfortably accommodate the fish. For small cichlids, often as small as 1.5 inches long, a 35-gallon tank may be large enough to house a few cichlids. For larger cichlids, choose a tank that holds 50 gallons or more. Some of the largest cichlids grow to be 3 feet long, so keeping them in a home aquarium can prove extremely difficult. As cichlids evolved, they developed two different breeding methods. The first type of breeding is called substrate spawning, where the fish lay hundreds of eggs in the sand and protect the eggs from predators. While some African cichlids breed this way, more species are mouthbrooders, which means the fertilized eggs mature in their mouths. Both types of fish tend to breed well in aquariums. However, be aware that cichlids become very territorial and aggressive when breeding, so aquarium size must be adequate to safely accommodate the aquarium residents at this time. National Geographic News: Lost African Lake Spawned Fish Diversity "Beyond Belief"